Not so long ago in the business realm, diversity and social justice issues were consigned to a dim, neglected area somewhere at the corporation's farthest perimeter, or locked outside the company gates altogether. Earlier this year, however, one of America's most powerful floodlights - the one that shines on White House honorees - illuminated these issues, and their HBS champions, in high relief. It was an indication of how much these matters have come to the fore. At a February 11 awards ceremony and daylong program of events in the nation's capital, President Bill Clinton presented the first annual Ron Brown Award for Corporate Leadership to IBM CEO Louis V. Gerstner, Jr. (MBA '65) and Levi Strauss CEO Robert D. Haas (MBA '68). The two chief executives received the newly established award on behalf of their companies' diversity and antiracism programs, respectively, and in recognition of their own significant involvement with those programs. 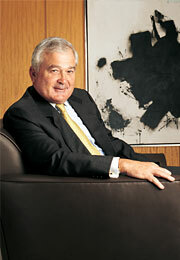 "At IBM," Gerstner said at the ceremony, "we're diverse by design, not mandate. With customers in more than 160 countries, our workforce has to reflect the rich array of cultures, perspectives, and human characteristics of all those markets. So we take our commitments to diversity as seriously as our obligations to our customers and shareholders." In accepting Levi Strauss's award, Haas noted that the company "has always tried to be a source of positive change in the communities in which we operate, and nowhere is the opportunity for change greater or more urgent than in the need to end discrimination. The people involved with 'Project Change' [Levi Strauss's antiracism initiative] have made a significant impact in their communities. They have proven that by working together the struggle for social justice can succeed." Changing workforce demographics and business conditions, as well as evolving social attitudes, have led many companies to a greater awareness of how diversity and community issues are intertwined with successful business operations. HBS associate professor David A. Thomas, an expert on diversity issues, notes, "Even companies that once were mostly interested in hiring women and minorities either out of a sense of moral obligation or merely to comply with the law now see the value that comes from broadening the demographics of their workforce. "With the emergence of global markets and a shrinking labor pool of talented people," Thomas continues, "today's companies are courting and working with diverse constituencies that were all but invisible to firms even a couple of decades ago. It is now widely accepted that workforce diversity helps a company relate better to, and hence do more business with, an evermore diverse domestic and international customer base." Furthermore, Thomas believes that companies will increasingly understand a more subtle but equally significant benefit: embracing diversity helps revitalize and strengthen the organization. "The very act of incorporating diversity forces the organization to rethink itself, a process that frequently spurs innovation, creativity, improvement, and, ultimately, competitive advantage," he says. IBM's Global Workforce Diversity programs suggest how that process can work. In receiving the Ron Brown Award in the area of "Employee Initiatives," Big Blue, which is also very active in its employees' communities, was recognized for its long-standing commitment to workforce diversity. As far back as 1914, IBM founder Thomas Watson made "respect for the individual" one of the three basic tenets of the company (the other two called for excellence in performance and customer service); IBM's first written statement of equal opportunity preceded the Civil Rights Act of 1964 by more than a decade. Today, the company routinely garners plaudits for its worklife balance and workforce diversity programs. One extraordinary IBM initiative that is both worker- and community-friendly, for example, allows employees to take a year off at full pay to work for community organizations. At IBM, on the recommendation of eight workforce diversity task forces consisting of company employees (Asian, Black, Hispanic, Native American, Gay/Lesbian, People with Disabilities, White Male, Women), management encouraged employees to form Diversity Network Groups (DNGs) organized around particular constituencies but open to everyone. At present, some 29 DNGs have been formed, focusing on networking, mentoring/coaching, and community outreach. DNGs are encouraged to consider the following questions: How can your group be more welcomed and valued at IBM? What can be done to maximize your group's productivity? What should IBM be doing to maximize the pursuit of business opportunities, based on the purchasing decisions of the customers you deal with? What should IBM be doing to help in the community? A DNG will signal management when it feels that IBM needs to make adjustments to improve its business performance relative to the DNG's constituent group. For example, a DNG of IBM employees with disabilities, aware that IBM possessed certain products, services, and expertise that could be extremely useful for the physically disabled, urged the company to make more of an outreach to such customers. IBM responded with a special advertising campaign that resulted in more business and spurred the company's thinking about potential, untapped applications and uses for its technology. The recommendations and actions of the DNGs, IBM feels, are important steps toward attracting and retaining a diverse workforce with the skills to achieve the company's marketplace goals. The input of diverse ideas improves company decision-making. By contributing their thoughts on new business possibilities and potential, the DNGs, in effect, help the company evolve. David Thomas also notes a heightened awareness among leading firms regarding the "social ecology" surrounding the corporation. "Part of what shapes the dynamics of the workplace is what employees bring in from the community," he says. "If organizations want to maximize the diversity they import from the community, it behooves them to think of themselves as community citizens. Like anybody else in the community, the firm can be part of the problem or part of the solution." Levi Strauss's community-focused, antiracism effort, Project Change, was honored for its work in four medium-sized U.S. cities where the San Francisco-based apparel company operates. The company has a long tradition of humanitarian outreach. After the 1906 San Francisco earthquake destroyed its facilities, the firm continued to pay its employees. During the Great Depression, Levi Strauss workers were kept on the payroll refurbishing their factory until business picked up. In 1982, when current CEO Bob Haas learned that employees were nervous about distributing AIDS information on company property, he went to the main lobby and passed out brochures himself. With the financial backing of the Levi Strauss Foundation (made up mostly of Haas family members) and with additional resources, management advice, and advocacy support coming from the company, each Project Change effort centers on forming a community-based multiracial task force comprising some fifteen citizens, including at least one Levi Strauss employee, from a cross section of the community. The idea is to help educate local citizens about racism, encourage them to build partnerships to help combat it, advocate positive changes in community policies and practices, and spread best practice to other communities. In Albuquerque, New Mexico, one such task force, working with the data gathered in a special "State of Racism" report commissioned by the Levi Strauss Foundation, showed that marked disparities existed between people of color and whites in educational opportunities, housing, and access to capital. It found, for example, that low-income whites were twice as likely to be approved for loans as Native or African Americans with higher incomes. The task force's work helped convince one bank president that such unjust practices had to be corrected. "Am I a different lender as a result?" the banker said. "I hope so." "If companies don't work on race relations," says Bob Haas, "we won't have enough qualified workers to run our businesses, and the purchasing power of a vast number of potential consumers will be stunted. Social unrest will compromise our quality of life, drain needed government resources, and place new demands on our companies." Indeed, while business may be commended for its social responsibility efforts in many areas, in others it exhibits characteristics common to the rest of American society: fear and denial. Haas notes that "when we tried to enlist other companies to join us in this effort, we didn't get any takers. Many viewed race relations as too explosive to touch, while others didn't consider it an issue at all." With business oriented to the bottom line, the question arises: Do companies that focus on employee and community well-being in fact perform better than those that don't? "There is some evidence to suggest the affirmative," says Thomas. "The service profit chain model, formulated by HBS professors Jim Heskett, Earl Sasser, and Len Schlesinger, demonstrates that heightened worker satisfaction creates greater customer retention. Workplace and career satisfaction improve employee attitudes, performance, and retention, reducing absenteeism, turnover, and the need for repeating costly investments in worker training." Well-treated, respected workers are, of course, more likely to work better and more productively. They help establish a company's good name and reputation, an invaluable asset in the community and among consumers, which in turn can provide an important boost for employee morale. Because IBM and Levi Strauss are not only among the most admired American companies but also among the most successful, they set a thought-provoking example for competitors and other American companies that are themselves, David Thomas believes, becoming aware of the positive in the proactive. "More and more companies now see that proactive positions regarding workforce diversity and community involvement are not only legitimate but indeed essential to their day-to-day operations and long-term strategy," says Thomas. This trend suggests that business - propelled by changing demographics, technology, and socioeconomic developments - may be reaching a significant new stage of organizational awareness and identity. Concludes Thomas, "There's still a long way to go; a lot of firms remain ambivalent about adapting to the new realities, let alone embracing them. But I believe that among leading-edge companies, there's a growing understanding out there about these issues. There seems to be a new business pragmatism about 'soft' issues that is gaining momentum."